Singapore Disability Sports Council provides transport to clients with mobility-related disabilities who may have difficulty relying on existing public transportation modes. Our purpose-built mini-buses are equipped with hydraulic lifts to carry passengers in wheelchairs. 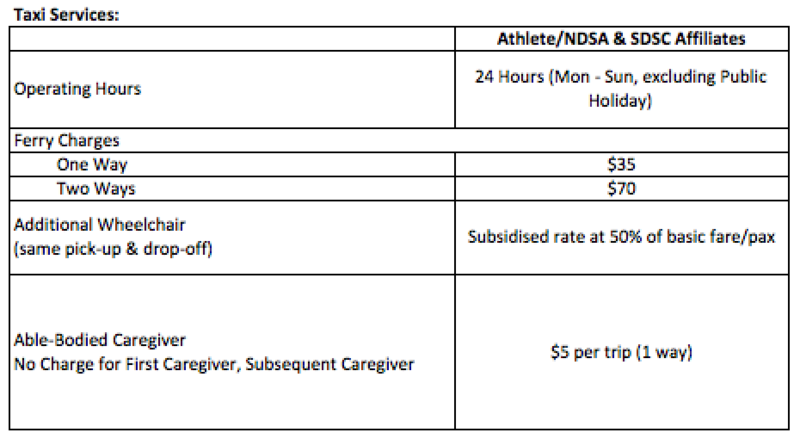 Only Individuals supported through SDSC sports programmes are entitled to the mentioned services below. Kindly book your ride(s) at least 3 days in advance and we will confirm with you by the next working day. Please click the appropriate fields to book your ride. Subsidy shall only be activated upon successful application, using Transport Subsidy Form.